The Shark NV106 Navigator Light Upright Vacuum and the NV105 are two of Sharks older models of vacuum cleaners which have since been superseded by the NV800 and AX900 ranges. However, the Shark NV106 and Shark NV105 are still good vacuum cleaners that are reliable and worth considering if you’re looking for a lightweight upright model. At only 10lbs in weight, they were designed to be light and easy to move around as they can be lifted with one hand. This makes them the lightest of the Shark upright models. In this article, we look at the NV105 and NV106 in depth. We’ll tell you whats good and bad about each model, and what to look for when buying a Shark vacuum cleaner. At the end of the article, we’ll do a quick roundup and suggest alternatives if the NV105 and NV106 don’t suit your requirements. The main reason to buy this model from the Shark range is because of it’s lightweight design. Weighing in at only 10lbs, the Shark NV105 and NV106 handle has a hole in the middle that allows you to pick up the unit easily with a single hand. The hole makes it more maneuverable and gives a better grip for moving it around the house. Unlike more recent Shark vacuum cleaner models, the NV105 and NV106 models don’t have a swivel head. This can make it a little bit harder to navigate around the feet of furniture etc – but is more than made up for by the lightweight design. When it comes to suction, the lightweight design doesn’t mean the vacuum lacks in power. In fact, the Shark range of vacuum cleaners are renowned for their sucking power. They are excellent at cleaning hard or soft surfaces and with the addition of several accessories, are good for cleaning upholstery, curtains or inside the car. The NV105 and NV106 models don’t disappoint on this front and even capable of picking up pet hair from almost any type of surface. Despite their lightweight design, they have similar sucking power as many of the latest models. Instead of significantly increasing sucking power, the later Shark models improved performance by adding DuoClean brushes and other innovations. If the DuoClean feature is important, you should consider the later NV800 or AX900 ranges. The vacuum cleaners are not as lightweight, but they do have superior cleaning abilities. We have a post about the DuoClean models where you can find out more. A rotating brush is built into the head of the unit. It can be turned on and off by using a button located on top of the handle. When you’re cleaning carpets and upholstery, you’ll want to leave the brushes turned on. They provide a deeper clean and dislodge debris so that it can be more easily vacuumed up. The cleaning head is 9.25 inches wide and when the brushes are rotating, you’ll notice the cleaner being pulled along the surface of the carpet. Even though the vacuum is not self-propelled, the movement of the brushes makes it a lot easier to move over carpet surfaces. A green light at the top of the housing reassures you that the brush is working correctly. If the head stops rotating, the light will turn red to warn you that something is stuck in the brushes. You will quickly find that the NV106 is extremely efficient at picking up hair from the carpet, but cleaning the roller is fairly easy. Over time, the hair will wrap itself around the brushes and make them less efficient. If this happens, unplug the unit from the wall and turn the cleaner upside down. The simplest way to clean the brush is to use a pair of scissors or a razor blade to cut along the length of the roller. Once the hair has been cut, it comes away fairly easily. When you’re cleaning hard surfaces, you’ll want to leave the rotating brush off. This stops surface dirt and dust from being agitated before it can be vacuumed up. As a lightweight model, the debris cup can hold about 2 cups of dust and dirt. This is not a huge amount but is actually a good balance between weight and functionality. Instead of having to take the entire vacuum cleaner outside for cleaning, the debris cup can be separated from the cleaning unit and taken to the bin by itself. Because of its bagless design, emptying the canister is quite a simple process. Make sure you’re holding the canister over a bin and then press the release button located near the base of the canister. The debris will fall from the bottom directly into the bin. Once the canister is emptied, you’ll be ready to go again as by snapping it back into the main cleaning unit. The entire emptying process only takes a couple of seconds. The cleaner comes with a reversible upholstery brush and crevice tool. These can both be stored onboard the vacuum cleaner itself. This means they won’t get lost and are always on hand. The cleaner also comes with a floor attachment that needs to be stored separately. One of the great design features of the NV105 and NV106 is its ability to remove the hose or wand from the body to vacuum high areas and between couch cushions etc. When it’s attached to the body, the hose is about 15 inches long. However, when it’s separated from the handle, it has a reach of about 35 inches. The power cable is 25 feet long and isn’t a retractable design. It needs to be manually wound around the holding lugs when you’re done for the day. Shark recommends that the filters are replaced every 6 months. 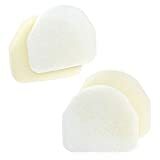 The cleaner uses two filter pads that are easy to buy on Amazon or through other suppliers. The Shark Navigator NV105 filter can be used a range of Shark models. These include the NV106, NV105, NV450 and NV480 range of cleaners. Instead of replacing the filters, they can also be washed in warm soapy water and left to dry. It is important that you let the filters dry completely before reinstalling them into the cleaner. If you don’t let them dry properly, the cleaner may develop mold issues. Replace filters every 6 months for best results; 2 weeks DOA replacement warranty! Some of the improvement in later Shark designs include a HEPA filter (for allergies), lights on the head of the cleaner and a swivel head. These newer models also tend to be a bit heavier. The Shark NV106 and NV105 don’t have any of these features. However, if you’re looking for a lightweight cleaner with good suction, the Shark NV105 and NV106 are both good choices. Even though they don’t have all the bells and whistles, they do an excellent job. SharkClean often has one product code for selling on TV Informercials, and another code they use when they sell through shops and online stores. To confuse matters further, some models have a single letter added at the end when they are produced for a specific retailer or chain store. In the case of the Shark NV106 vs NV105, the main differences relate to the color of the cleaner itself and the where you can buy the unit. The NV106 and NV105 come in Mauve and Blue respectively. The blue NV105 is the model you can normally buy in stores or online. If you see a mauve NV106 online, it is normally a refurbished unit or part of the stock sent to stores by Shark when they released the newer models. The combined manual for the Shark Navigator NV106 and NV105 can be downloaded from the SharkClean support website or by using the following direct link. Note : The manual is applicable to the entire NV100 range of vacuum cleaners. The Shark NV105 parts can also be used on the NV106 and NV100 models. A great lightweight vacuum from the Shark range. Both the NV106 and the NV105 perform well on hard and carpeted surfaces. If you’re looking for the latest model, then you would be better off looking at the Shark NV803 which also has the DuoClean roller and a HEPA rated filter. This is a lot heavier to move around, but it also has superior cleaning power to NV105 and NV106. Being a slightly older model, the NV105 is a really cost-effective option. Most of the time you can get it for well under half the price of the other Shark models and this makes it an ideal vacuum to keep as a second vacuum for smaller jobs around the house or in the holiday home.